There are lots of great ways to use a SMART Board, but where do teachers get all these great ideas? The SMART Exchange website is an online portal for teachers to download and share Notebook software lessons. It has thousands of members, and is used daily by educators who are looking for the latest free SMART Board resources to enhance the teaching and learning in the classroom. However, with so many resources available it is important to know how to narrow down your choices and find what is most relevant to you and your students. Topic searches are by far the most common way to find what you are looking for on SMART Exchange. You could click one of the subject areas under the heading 'Browse by Subject', but this will return a very broad range of activities and resources. A better idea is to type some keywords into the search box at the top of the page. Each lesson is tagged by the author with keywords that describe the activity, so you can often be quite specific with what you are looking for. On the results page, you can customize your search results. Select from the drop down menus at the top of the page to narrow the results to a particular subject, grade level, or both. You also have further options to filter the results on the left hand side of the page. Here you can narrow your search by the type of resource. For instance, you will often have the choice to show only SMART Notebook lessons, or SMART Response question sets, and this will narrow your results to a more manageable selection. Once you have filtered your initial search results, you have the option to preview files that look interesting by clicking on the 'click to preview' button. This will take you through each of the pages on the Notebook file so that you can see what the resource entails. If it looks good, click the green download button and save it to your computer. If you don't have the full version of SMART's Notebook software, it is worth remembering that you can open Notebook files for free using the SMART Notebook Interactive Viewer or the Notebook Express website. 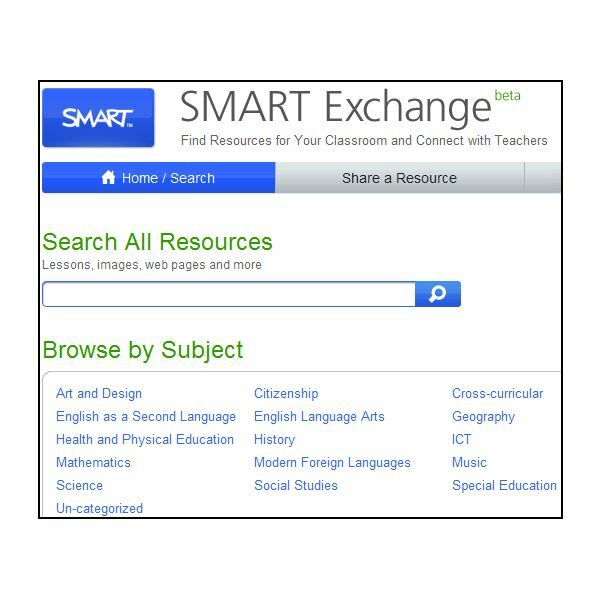 The SMART Exchange website has the facility to search for SMART Board resources by content standards. Simply click the link at the top of the page labeled 'Standards-Correlated Lessons' and you will be taken to a specially modified search page. On this page, you select the content standards associated with your state or country, your grade level, and subject. Once you click the view button, you will be presented with a complete list of content standards for that subject area. If there are Notebook lessons that match one of these standards, you will see a blue 'View lessons' link next to the standard, (see picture right for an example). Click on this link to view the lessons and see how relevant they are to your planned lesson. Yet another way to search for SMART Board resources is to search for lessons that match a particular textbook series. For instance, if you are using the Harcourt Reading Series, then type 'Harcourt Reading' into the main SMART Exchange search box and all the lessons that are tagged with 'Harcourt Reading' will be displayed to you in your search results. Again, you can filter these resources by type to narrow your search further. So whether you are looking for a useful, new website, or a question set to deliver assessments with the SMART Response system, you need only click the links at the side of the page to focus your search. 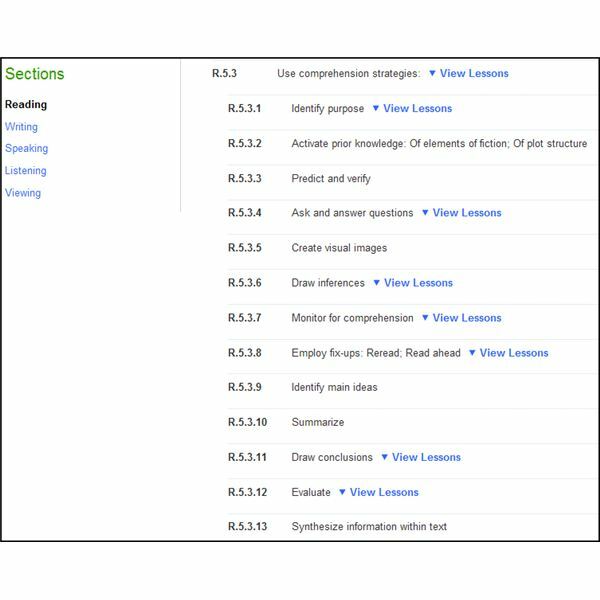 Similarly, if you are looking for lessons that are specific to a certain grade level, then make sure you select that from the top of the page too. So, why not visit the SMART Exchange website today and see what SMART Board resources you can find to improve the teaching and learning in your classroom. How to get the best out of the SMART Board in your classroom. Tips, tricks and suggestions on raising student engagement with an interactive whiteboard.